When former Navy SEAL Nick Foley’s expected dinner date with Dr. Dazhong “Dash” Chen is postponed, neither he nor the microbiologist from the Chinese CDC have any idea they, and the world, will soon be in unbelievable danger. Over a dozen bodies have been washed ashore in Hong Kong, and Dash is asked by Commander Zhang of China’s Snow Leopard Counterterrorism Unit to autopsy them. While Dash is transported to the scene, Chet Lankford, the CIA’s top man in Beijing, asks Nick for a favor: Go to Xi’an and discover what happened to one of his men, a new agent on a routine surveillance assignment. It’s nothing dangerous, because Peter Yu was working on standard monitoring. Reluctantly, Nick agrees. After all his date with Dash isn’t going to happen, so he needs something to fill his time . . . but he’s no sooner arrived in Xi’an than he’s immediately embroiled in a bombing, mass murder, and finds himself on the run from the Chinese authorities. Dash’s autopsies disclose disturbing facts. Most of the bodies lack their eyes, a disquieting resemblance to a previous case on which Dash, Nick, and Zhang worked. The corpses also are missing their vital organs, as well as hands and feet, and some have tattoos on their foreheads in hanzi characters. Dash thinks they’ve discovered an organ-selling ring operating on a tremendously ambitious scale. It’s only when Nick learns the missing agent is one of the corpses, that he realizes he, Zhang, and Dash are all working on the same case, and everything points to an international multimillion dollar biotechnology firm. There’s also a triangle forming—between Nick, Commander Zhang, and Dash. When a high-ranking Chinese officer is murdered and several boxes of bodies are found floating in the sea, the stakes become more deadly. With Nèiyè Biologic involved with a rare disease and a megalomaniacal killer in search of the fabled Elixir of Life, Chinese and American must set aside personal enmity and cooperate to prevent a more lethal scheme perpetrated on a much grander scale. It’s a case in which Nick could lose the woman he loves if his judgment and his skills aren’t honed to their best . . . but if it he succeeds, he may find himself languishing in a Chinese prison. The novelty of Chinese and American agents working together instead of against each other isn’t spared notice in this thriller. The description of official operations, as well as the cities themselves have an authentic feel, as if the authors had actually seen and been privy to both. Commander Zhang and Nick Foley are carefully delineated characters, men of skill and bravery, and equally as honorable. References are made to the previous case on which the two worked, showing they, and Dash, have a history that will pique the reader into seeking out that prior adventure as well. This is definitely an action-packed thriller with an exotic Hong Kong setting. Because of the subject matter, it’s laden with medical and technical terms but not so much that it loses the reader’s interest in the telling. 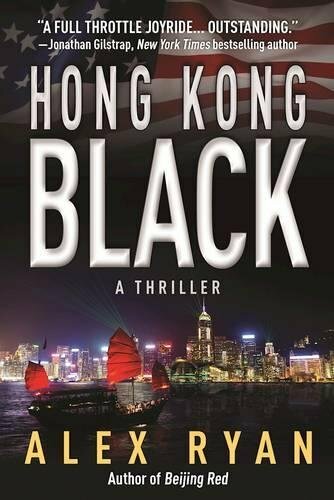 If Beijing Red is anything like Hong Kong Black, author Alex Ryan has a bestselling series on his hands.